Russian-backed militants have fired 37 times at the positions of the Ukrainian Armed Forces over the past 24 hours, wounding one Ukrainian serviceman, the press center of the headquarters of the Joint Forces Operation (JFO) has reported. "Invaders opened fire on the positions of Ukrainian troops 37 times. The enemy used weapons banned by the Minsk agreements six times […] One Joint Forces serviceman was wounded in fighting in the past day," the JFO HQ said in a report on its Facebook page early on Friday. Militants fired at Ukrainian positions near Stanytsia Luhanska, Krymske, Novotoshkivske, Luhanske, Troitske, Verkhniotoretske, Avdiyivka, Krasnohorivka, Maryinka, Berezove, Starohnativka, Hranitne, Chermalyk, Pavlopil, Hnutove, Vodiane, Lebedynske, and Shyrokyne. Illegal armed formations fired from grenade launchers, heavy machine guns and small arms. In addition, 82mm mortars were used near Chermalyk, Hnutove, and Vodiane, and a 120mm mortar near Chermalyk and Krymske. Ukrainian positions near Krymske, Troitske, Chermalyk and Hnutove were fired at fired from the armament of infantry fighting vehicles. 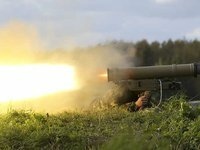 Guided anti-tank missiles were used near Novotoshkivske and Hranitne. According to Ukrainian intelligence, one militant was killed and four more were injured in the past day.